Baseline Survey Report:IV. Hanku, Jumla. Integrating traditional crop genetic diversity into technology: Using a biodiversity portfolio against unpredictable environmental change in the Nepal Himalayas. 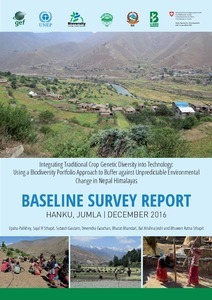 The Baseline Survey Report, Hanku, Jumla’ provides a summary of the various facets of the mandate crops’ genetic resources, traditional knowledge of the farmers, and socio-economic context of the farming systems present in the Jumla project site (Hanku VDC, Jumla District) of the Local Crop Project. The Local Crop Project is being implemented from 2014 by the United Nations Environment Programme (UNEP), and is executed in Nepal by Bioversity International, National Agriculture Genetic Resources Centre (NAGRC) within the Nepal Agricultural Research Council (NARC), Local Initiatives for Biodiversity, Research and Development (LI-BIRD) and the Department of Agriculture (DoA). The baseline study aims to provide guidelines for the planning of future programmes in the sites.